From the top of the Squaw Creek lift you can ski down for a view of the lake before enjoying untracked powder. Imagine this: The morning snow report boasts eight inches of fresh, but instead of rushing out in the pre-dawn darkness to line up at the lifts, you linger over a second cup of coffee. And when you eventually click into your bindings, you glide right onto the chair—where the lack of crowds makes it seem as if the bullwheels are turning just for you. You could get this experience by joining the Yellowstone Club—or you can stay at one of these six properties, which deliver guests to nearby ski areas via exclusive (sometimes private) lifts. The first-class access feels like flying on a charter jet rather than a commercial airbus. And on a powder day? The only lines you see will be your own tracks down the uncut slopes. 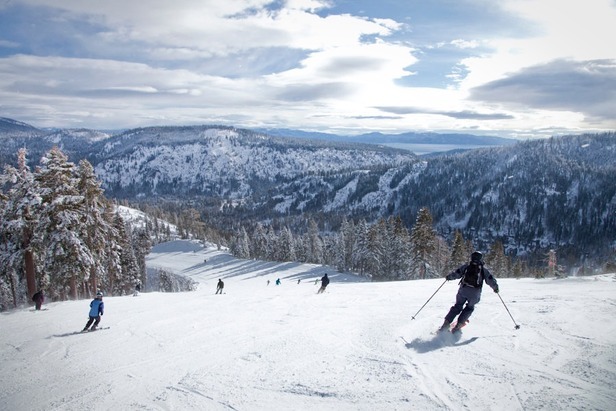 As a guest of the Resort at Squaw Creek, you have semi-exclusive access to the slopes via the Squaw Creek triple chair.